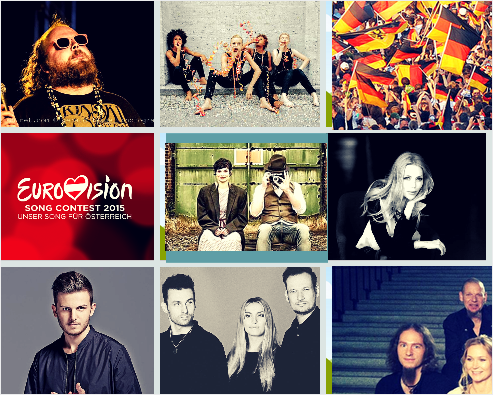 Germany – Get to know 7 of the 8 finalists for the German Eurovision 2015 selection. Is there another Lena here? The 7 established acts who will compete in the final of Unser Song für Österreich, to be held on March 5th were announced today by NDR (German National Broadcaster) They will be joined by the winner of the Wild Card Selection that will be known on February 19th. “FAHRENHAIDT is modern Nature Pop – inspired by nature and reacted with modern electronics. FAHRENHAIDT is the new project of two internationally successful Berlin music producer Erik Macholl John and Andrew and are joined by Amanda. They describe themselves as to escape the city and want to FAHRENHAIDT to encourage people to come to rest. But how do you switch off? Permanent vacation? Is not there for most. They describe themselves as a Medieval Music / celtic & nordic Folk / Paganfolk band and play many old and celtic instruments. They are based in Munich. Andreas is a singer/songwriter and producer. His genre of music is blues, soul, folk and rock. He comes from Gemünden am Main in Germany. He appeared on The Voice of Germany in 2013. Is actually a male solo singer Jewgeni Grischbowski. His music genre is House / Electronic / Dance. He is a Russian/German producer and songwriter based in Munich and signed to Polydor/Universal Music. He started his career in 2009. His debut EP “Get The F**k Up” reached #4 in the German Club Charts in 2010. Afterwards he released 4 EP´s and several remixes for artists like Gorillaz, OneRepublic, Skrillex, Pendulum, Iggy Azalea and many more. His Remix of “Gorillaz – Feel Good Inc.” reached #2 in the Hypem Charts. The Remix of “Gorillaz – Dare” climbed up to #5. There you have your 7 German Finalists that will be joined by the Wild Card winner. What is interesting is that some of the music for the acts that is on YouTube is actually eligible for Eurovision 2015. So take a look as one of them could be in the final. There is certainly a varied choice of music in the German selection. What do you think of the 7 acts announced? Who would you think would suit Eurovision most? Is there a winner there?